Are the first days after receiving an artificial wrist joint going to be very painful? How long does the cast have to stay on? Is it allowed to exercise during the aftercare period? What else is important during the aftercare period? Generally speaking, yes. Modern pain management and anesthesia however dispose of various options to dim down the pain after surgery. In the case of hand surgeries the implantation of a so-called plexus catheter proved an efficient method to help the patient cope with the pain. This procedure is based on the infusion of an anesthetic agent over several days close to the nerve cord of the arm, leading to partial numbing of the entire arm but also to a much more bearable pain level for the patient. 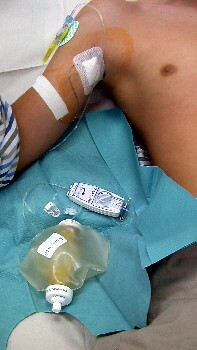 This infusion systems as seen in the image allows for pain management through infusions close to the nerve cord in the arm pit and is therefore suitable for all large interventions on hands or arms. This is a very efficient method to battle pain. What other immediate aftercare measure is required? After two to four days usually the drainages will be removed. The stitches come out after fourteen days. Surgical wound one week after implantation of an artificial wrist joint. In most cases the stitches will be removed after twelve to fourteen days. There is no set time frame; it all depends on how the artificial joint is anchored. It may be possible that a multiple week cast immobilization is necessary to allow the joint to properly fuse with the bone. Once the cast comes off it may also make sense to improve the density of the wrist joint by using a wrist wrap whenever performing strenuous activities. Any sports that require the involvement of the hands should absolutely be avoided in order to protect the artificial joint. The only exception to the aforementioned limitation is swimming! Other sports like e.g. jogging are allowed (However it is important to minimize the risk of falling!!). 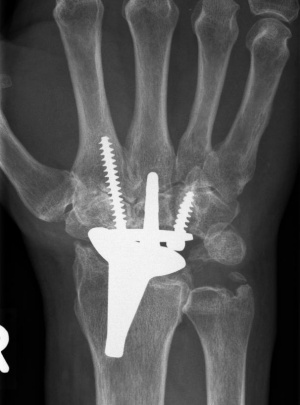 X-ray image of the wrist following the implantation of an artificial wrist joint. The routine checkups also include x-ray evaluations of the position of the prosthesis in the wrist. The image shows a favorable position of the wrist joint prosthesis three months after surgery.